During the summer of 2010, 2 parties of Friends members visited the cabin to verify reports of the deterioration of the stain on the outside. It was very evident that something needed to be done and soon. On the siding most exposed to the wind and sun, the stain had virtually disappeared. On top of that, the fires in the valley below (summer 2003) had attracted flickers to the area who have been attacking the siding during mating (the bigger the noise, the better the mate) and even nesting in a few spots. During the spring of 2011, the Friends, in consultation with the ACC and BC Parks, prepared for a work party to take place in early August to paint the outside of the building and refinish the windows on the inside. 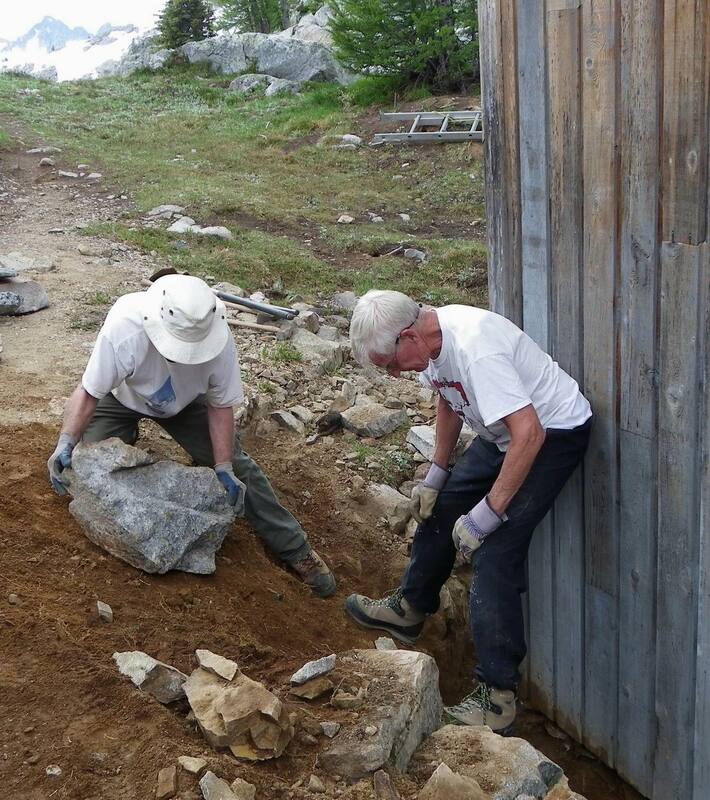 It was also decided that the bank on the east side of the building would be widened and a rock wall would be built to help prevent the soil from washing in against the cabin. On August 3, 5 volunteers met at the Range Helicopters hanger at 6:00 AM to load packs and get a briefing from the pilot. By 7:00, the helicopter was circling the landing platform at the cabin in preparation for landing. Although the folks who had hiked in the previous day were aware that a helicopter would be landing at the cabin, it was clear that the early morning timing of the visit was unexpected. After the volunteers had unloaded the chopper, the pilot left for the Woodbury parking lot to pick up 2 more volunteers and 3 ACC crew members. It took several flights to bring up the personnel and the sling loads of paint, shovels, packs and material that the ACC would be using to upgrade the cabin. 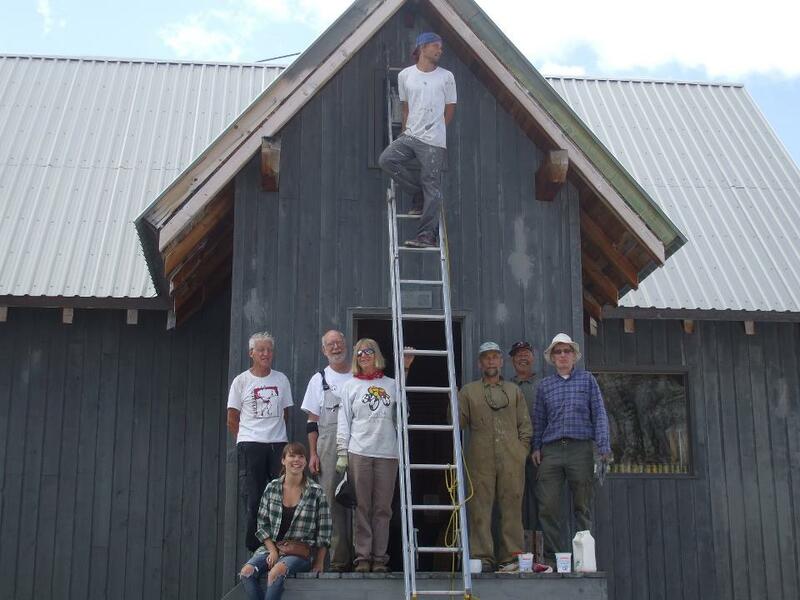 Under the supervision of experienced painter Jered Devries, a crew started the painting while Eric Sargent, Maurice de St Jorre and Fred Thiessen (who had walked up from the parking lot before the helicopter had finished ferrying loads up) started on the trench behind the cabin. Painters Helen and Rick Foulger, Tessa Gabiniewicz, and Jered were quickly aware that this was different from your average house painting - the wood was so weathered that the stain disappeared as fast as it was applied. It finally took 3 coats to cover the wood! The outside frames of the windows had weathered so badly that it was decided to stain those the same colour as the siding (they had originally been clear coated to show the natural wood colour). In the meantime, Bill Bryce started on the interior window frames while the ACC crew, (Darren Enderwick, Earl Takahashi and Roger Montgomery) reorganized the caretaker's quarters, assembled a new kitchen work table and completed their upgrade project. After finishing the rock wall, Eric and Fred joined the painting crew while Maurice tackled the reorganization of the shed. 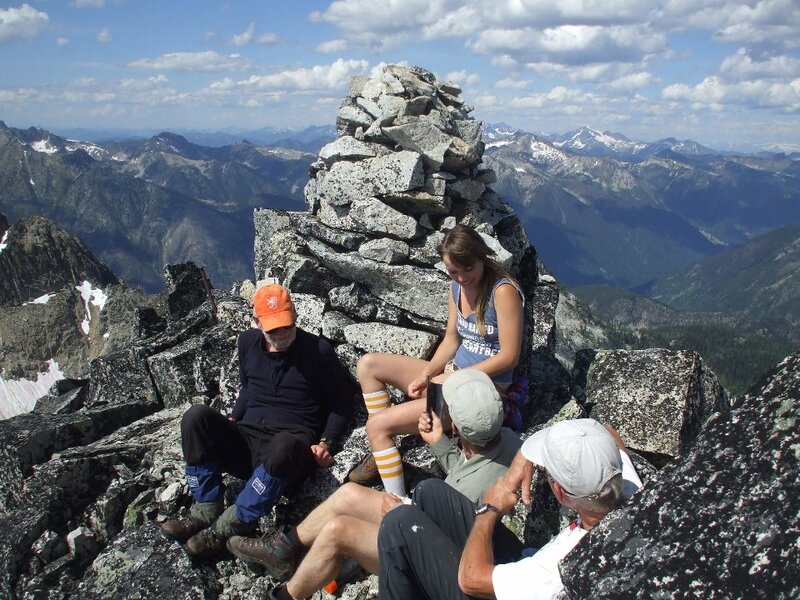 The ACC crew left early the second morning for the high traverse over to the Woodbury Cabin. It took 2 1/2 days of painting to complete the project. On Friday afternoon, two groups headed up towards the Violet Mine at Caribou Pass - all in all, a great way to cap off their stay. 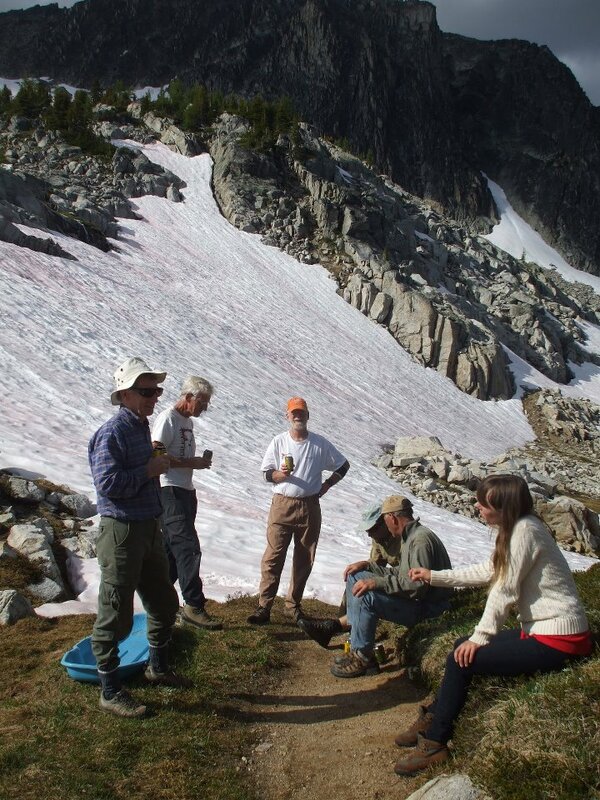 The Friends of West Kootenay Parks would like to thank Helen and Rick Foulger, Eric Sargent, Maurice de St Jorre, Fred Thiessen, Bill Bryce, Tessa Gabiniewicz and particularly Jered Devries (for his painting expertise).